Annette is a multi-skilled performer who studied ABRSM classical piano to Grade 8 and violin to Grade 6. 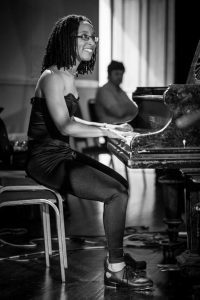 In 2003 she began studying blues and jazz piano to help support her tap dance career and has since developed as a composer, arranger and music director as well as a performer. Annette completed a Diploma in Jazz and Popular Music Studies at Goldsmiths College at Goldsmiths College in July 2012 for which her instruments were piano, tap dance, drums and singing. In 2013 she was pianist in the house band for Jazz Alive’s Open Jam Sessions. As a violinist, Annette has performed at the Southbank Centre with Goldsmiths [big] String Orchestra for Robert Mitchell: Invocation (London Jazz Festival 2014) and Antonio Forcione’s Sketches of Africa (2013). She also played in the UK premier of Nick Zinner: 41 Strings at the Royal Festival Hall (Meltdown Festival 2014). As a tap dancer Annette has performed at numerous music and dance events. In theatre she has toured with shows in both the UK and Europe. Highlights include performing with Michèle Drees Trio at Ronnie Scott’s Women in Jazz (2010), Turned on Tap at the Queen Elizabeth Hall (2005) and Duke Ellington’s Sacred Concert at Bristol’s International Blues and Jazz Festival (2013). Since 2009 Annette has been one half of the sassy, swinging, cabaret duo, The Tipton Project, where she utilises her skills as pianist and tap dancer. The Tipton Project is a live music act that fuse comedy, dance and circus in highly engaging and dynamic acts.